This is one of the great cars of our time. 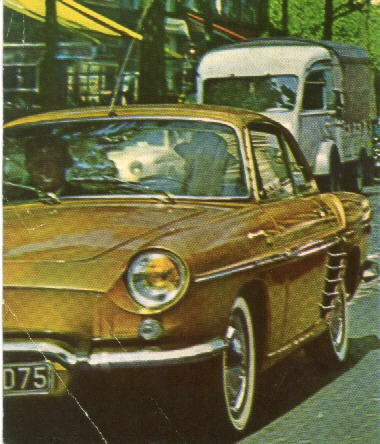 The world over, drivers of the Dauphine delight in her dashing performance, Comfort, safety and economy. (Gay and trouble-free, the Dauphine has become a part of the modern way of living. 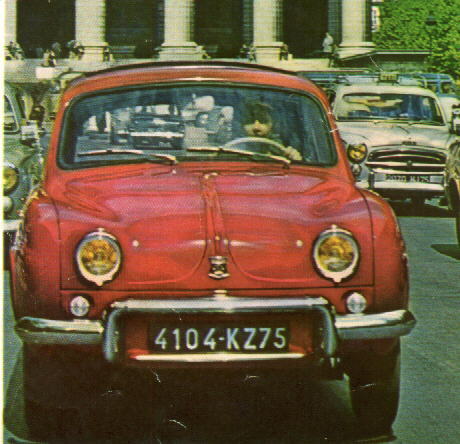 early 2 million strong on the roads of to-day, she out-classes and out-shines her competitors on main streets and open highways alike. The Dauphine remains consistently ahead. This year, Renault provides vet another significant technical advance by offering a fully synchromesh gearbox for all forward gears in the 3-speed version. Now, the precise and easy move-ment into t}first gear makes stop-start town driving both effortless and simple, putting the extra(1 strength of the engine at your immediate disposal for swift acceleration. In the exciting 4-speed version, the synchromesh gears on second, third and top have ratios carefully calculated to provide that extra boost of power at the right moment. New colours new interior trims and superb new seating com-fort make the Dauphine more elegant and attractive than ever. Sweetly into first, and your Dauphine is away like a flash. swiftly into second and you'll be doing 40 in a matter of moments. (That central gear lever set in the floor makes it all so easy.) By the time you're in top, you're already far ahead of the rest. Like quicksilver you thread your way through the traffic, in and out, neat and precise. The light, accurate steering and the exceptionally tight turn-ing circle of your Dauphine allow you to turn on a postage stamp and park in spaces impossible to others. whether taking the children to school, shopping by car or just driving for the fun of it, every woman knows she is looking at her best and driv-ing at her best behind the wheel of the Dauphine. Easy to handle and delightful to drive -- the Dauphine is the toast of sweethearts and wives the world over. At the rear. 4 cylinders with removable wet liners. Bore 2.28" (58 mm.). Stroke 3.15" (80 mm.). Cubic capacity 845 c.c. Compression ratio:-8:1. High-output cylinder head. U-flex piston rings. Cooling by pressurised water circuit. 32 PJBT Solex carburettor, with automatic choke and anti-vaporising deflector plate. Distributor with automatic centrifugal advance and depression corrector. Actual power output: 30 b.h.p. (S.A.E.) at 4,500 r.p.m. Max. torque: 49 lb./ft. (6.9 m./kg.) at 2,500 r.p.m. Over two million of these tried and tested “Ventoux” engines are now in active service throughout the world. They are not only fitted in the Dauphine but also in the range of Estafette light commercial vehicles. Furthermore, in their Gordini version, they are fitted to the Renault Gordini and the Renault Floride alike. Capable of tens of thousands of miles of trouble free running, here is an engine in which brilliant performance is matched by incredible petrol economy. Rear: independent with coil springs and telescopic shock absorbers plus two Aerostable (Gregoire Patent) pneumatic cushions. Front : independent with coil springs, telescopic shock absorbers and Aerostable auxiliary cushioning. Anti-roll torsion bar. BRAKES: Diameter: 9" (22.8cm.) Width: FRONT 137" (35mm. )REAR 1.18" (30mm.). Hydraulic on all four wheels with floating self-centring shoes and automatic pressure control on rear brakes. STEERING : Rack and pinion with compensating springs. TYRES: 135 X 380 (5.00 X 15). Tyre pressures: Front 14 lb. (1 kg.). Rear 23 lb. (1.6 kg.). MISCELLANEOUS: Fuel Tank: Capacity 7 imp. galls. (32 litres) - a cruising range of 310 miles (500 kms.) without refuelling. The ignition switch to the starter with automatic choke is set right below the steering wheel. It incorporates the NEIMAN anti-theft device by which the steering wheel can be locked. SOFICA heater and demister with air-cleaning filter. TRANSMISSION: 3-speed gearbox all 3 forward speeds synchromesh. 4-speed gearbox 2nd, 3rd and top synchromesh. Gear lever mounted centrally on the floor. At the rear. 4 cylinders with removable wet liners. Bore 2.28" (58 mm.). Stroke 3.15" (80 mm.). Cubic capacity 845 c.c. Compression ratio: 8:1. Large-size overhead valves with pushrods. High-output cylinder head. U-flex piston rings. Cooling by pressurised water circuit. 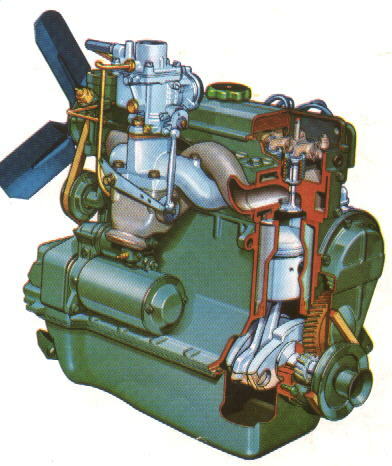 32 PJBT Solex carburettor, with automatic choke and anti-vaporising deflector plate. Distributor with automatic centrifugal advance and depression corrector. Actual power output: 40 b.h.p. (S.A.E.) at 5,000 r.p.m. Max. torque: 48 lb. ft. (6.6 m. kg.) at 3,300 r.p.m. You can always rely on engineering from Renault with its reputation second to none. 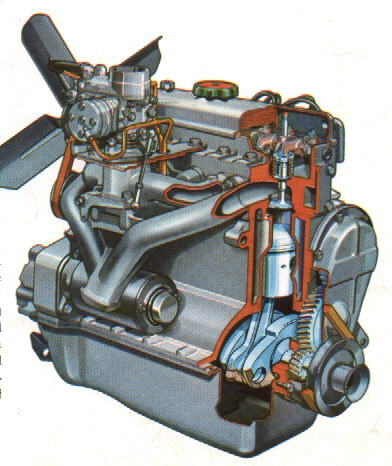 The Gordini version of the “Ventoux” engine 4 develops 40 b.h.p. (S.A.E.) at 5,000 r.p.m. This additional power is obtained by the use of a re-designed cylinder head. special inlet and exhaust manifolds together with a special camshaft and a 32 PIBT Solex carburettor. TYRES: White wall. 145 X 380 (5.50 X 15). MISCELLANEOUS: Fuel Tank: Capacity 7 imp. galls. (32 litres). The ignition switch to the starter with automatic choke is set right below the steering wheel. It incorporates the NEIMAN anti-theft device by which the steering wheel can be locked. windscreen washers and an electrically boosted SOFICA heater and dc-mister (with air-cleaning filter) are fitted in the Gordini. TRANSMISSION: 4-speed gearbox - 2nd, 3rd and top synchromesh. Gear lever mounted centrally on floor.